This is a machine I found at the 2002 Peoria, Illinois Hamfest. Came to me looking pretty decent, but it had quite a few problems, the most severe being misconfiguration and messed up SCSI termination. One nagging problem that it ended up having, however, was the constant loss of the date and time if the machine was turned off. I thought this was caused by a bad clock battery but it turned out someone had left the power on password clear jumper set. The machine works perfectly now but I think it has suffered a bit from having that jumper set for so long. The date and time holds when the unit is powered off, but every now and then on warm boots the machine loses both time and date settings once again. As an aside, I should note that contrary to what others may say, this machine (or at least my particular unit) DOES NOT require IML nor is it limited to 1GB or less hard disk size. Your machine may vary from this though. 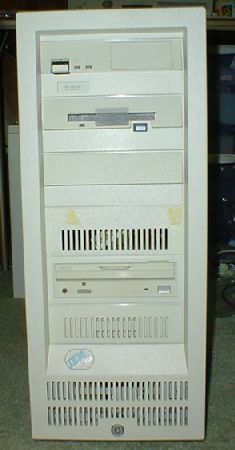 Right now this computer is running Windows 95 OSR 2.5. Like most of my computers, it works on cracking RC5 encryption with Distributed.net.